The big winners appear to be the Greens, up to 2.5% to 9%, and ACT, up 2% to 3.5%. NZ First lose a point to 4%, but would still be competitive if this poll is accurate. 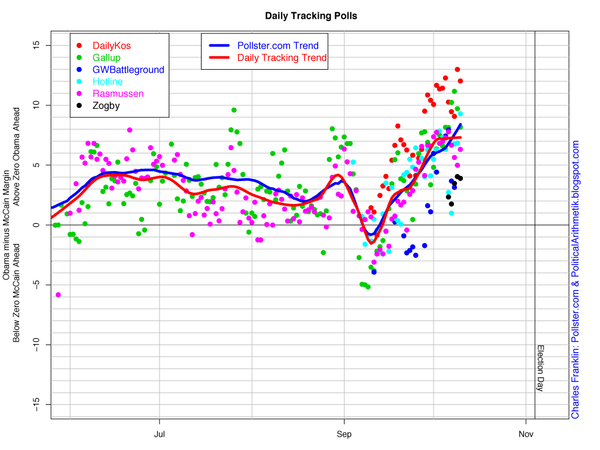 Latest poll (N = 923) taken between September 22–October 5, 2008. They’ve done another poll with cell respondents included, and updated their findings. Their key finding is unchanged. 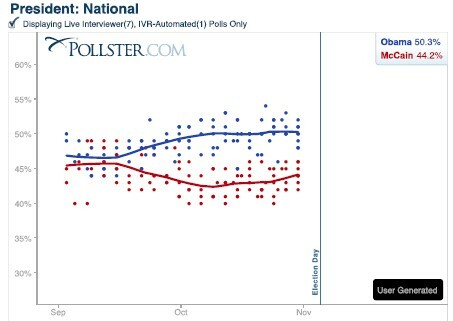 Including cell respondents makes a little difference–some 3% in the September poll (see table below). Well, jafapete took off for Waiheke and it seems he’s not coming back. AndrewE has suggested that he drowned himself in a pail of ale after realising that Helen has no principles. Not quite. More on that later. This post’s for Andrew. Last night’s Robert Chapman Lecture “Polls versus Expectations – Howard’s End in Australia and are there lessons for New Zealand?” was interesting, mostly because it is always good to stand back and contemplate recent history for patterns you might have missed. In this we were assisted by Australian election commentator Antony Green. 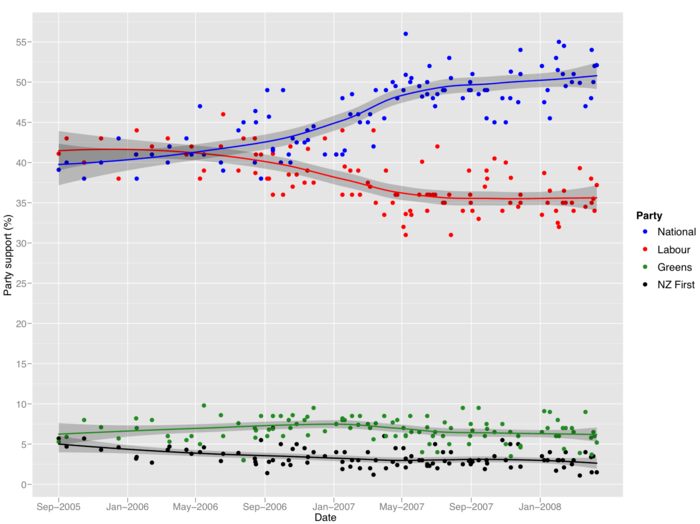 Green noted that in the 2004 and 2005 elections in Australia and NZ, the polls had been very volatile, and that when that is the case it is easier for an incumbent government with waning popularity to turn things around during the election campaign. He didn’t state the converse so explicitly, but I shall. Like the PM and many others, I can count Bob Chapman amongst my mentors. Many have commented on Bob’s grasp of the finer detail, but it was his capacity to distill this vast knowledge into easily understood wisdom that I valued most. (“The best ideas are the big, simple ideas”, he said once.) Bob always maintained that if the opinion polls clearly had one party ahead of the other for a year or more before an election campaign, then the party that had enjoyed the lead would win. This has always proved to be the case. So the message from the graph above is clear, even if it’s not in tune with my sentiments. There were some valiant attempts to avoid the message last night. “What about all the people who didn’t have landline phones, worked evening shifts, etc?” Green patiently explained that pollsters weighted their data to compensate for these known biases as best they could. After all, they have a lot to lose if they get it wrong. “What about the extra 100,000 unenrolled voters ferried to the polls in South Auckland?” asked another, seemingly oblivious to the tuning fork graph in front of her, or maybe not able to convert the percentages into numbers. 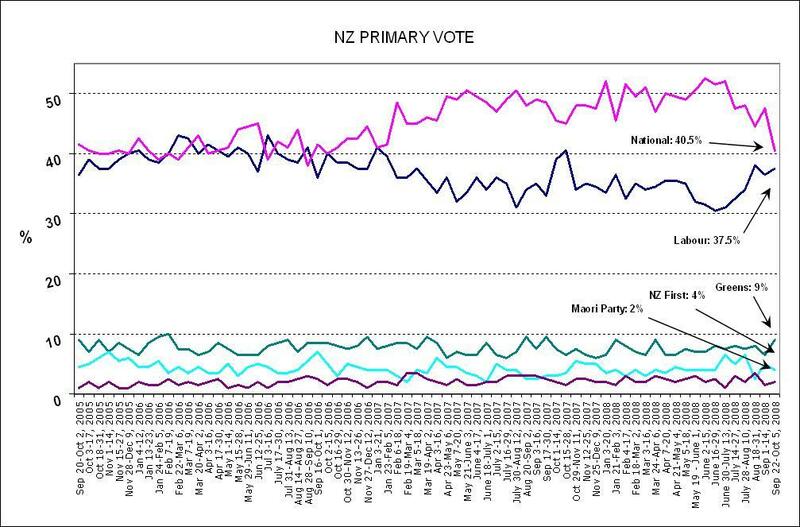 However, as Green noted, in an MMP context National’s higher vote need not necessarily lead to their taking government. It is also quite possible, for example, that National holds office as a true minority government, with the Maori Party sitting on the cross-benches vetoing anti-Maori or anti-low paid legislation, but not bringing the government down. As I look at the tuning fork, that second-best scenario is some consolation.